Product prices and availability are accurate as of 2019-04-11 02:14:14 EDT and are subject to change. Any price and availability information displayed on http://www.amazon.com/ at the time of purchase will apply to the purchase of this product. 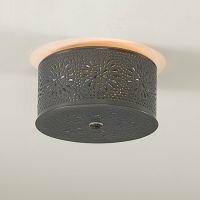 Round Ceiling Light with Chisel in Country Tin Lovingly crafted by hand, our Round Pierced Ceiling Light is the perfect lighting accent. 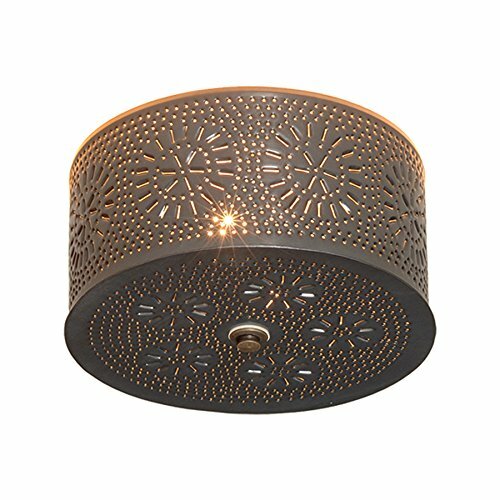 This fixture creates a cozy country atmosphere in your home. Regularly priced $46.95 on sale for $42.25 through April 30, 2011. Direct wired with two standard sockets, 25 watts max. per socket. Decorative light only. Country Tin finish. Handcrafted in Pennsylvania. This light is UL listed and has a 5 year guarantee. Item Size: 5 1/2"H x 9"Dia.